Some people like their pastry flaky or even crusty, right. Well how about this? 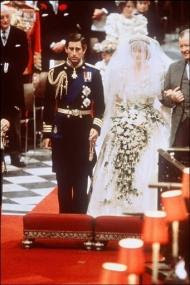 A slice of wedding cake from Princess Diana's 1981 wedding recently went for almost $2,000. Read HERE to find out who kept it for so long and who bought it. This story is crazy to me. What got me was this statement..."It was kept wrapped in clingfilm in an attic for the past 27 years. "...YUCK!